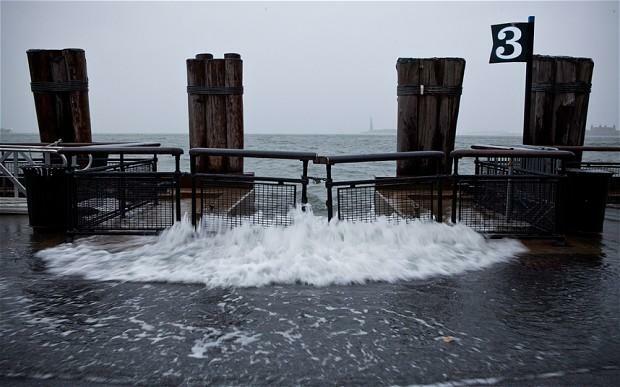 The devastation of Hurricane Sandy has transfixed the nation's attention, with many people across the country helplessly looking on at the mid-to-upper East Coast as it suffered the worst weather-related event in its history. The damages are high, particularly in the New York/New Jersey area, while emergency services scramble to help people deal with power outages and other destruction across the broader region stretching all the way from the Carolinas to parts of New England. People rallied on social media to report their status, express concern or check in on loved ones. So far, the damage has ravaged public transit systems and innumerable private homes, the death toll has reached 39 in the U.S. as of this writing (not including the 69 people in the Caribbean), and 7.4 million people are without electricity, after facing a nightmare of high winds, punishing rains and flood surges or fires in the dark last night. In all this, there is only one certainty: Recovery won't come easily, especially to the areas that were the hardest hit. Relay social media updates: If affected family or friends can only send out short, infrequent messages about their status, spread the word to concerned family members or other parties — especially the less tech-savvy ones. It will save a lot of worry and hopefully keep well-meaning people from endlessly trying to call (and potentially zap) much-needed battery power for the victims. Donate blood: Roughly 100 Red Cross blood drives were nixed because of the storm, so supplies are down in the areas where they may be needed the most. If you're in the New York//New Jersey area — and are safely able to venture out and donate blood — call the New York Blood Center at 800-933-2566 or visit www.nybloodcenter.org. Salvation Army: SA has about a dozen mobile feeding units and shelters dotting the East Coast, and they're helping thousands in some of the most dire areas. If you can kick in something to help the cause, visit donate.salvationarmyusa.org/Disaster to send money to the Hurricane Sandy relief effort or click here to make other donations. Feeding America: The organization — which usually offers assistance to low-income Americans — has stepped up for disaster outreach. It has equipped outposts in key locations with thousands of pounds of emergency food, water and supplies, so its pipeline of support is in place to channel assistance to disaster victims. Go to Feeding America online or call 800-910-5524 to donate. AmeriCares: Some hospitals had to evacuate during the crisis, while countless other wounded may be stranded, unable to make it out and get help. AmeriCares rallies to get medical supplies to people affected by the hurricane. To donate, go to AmeriCares' online Disaster Relief Fund and fill out the donation form. World Vision: Thanks to World Vision's disaster response effort, many survivors of Hurricane Sandy will be able to get flood clean-up kits, personal hygiene items, blankets and emergency food packages. To keep the supplies coming, you can send your support by giving to its Disaster Response fund at this donation page. Save The Children: STC offers emergency support services with children's needs in mind. To donate, visit Save The Children by clicking here. Samaritan's Purse: SP is sending out a call for volunteers to help with debris clean up and mud outs. If you're interested in rolling up your sleeves and getting hands on, you can sign up here. Do you have other disaster support resources to share? Let us know in the comments.